Party Party Trend: Mario Bros. 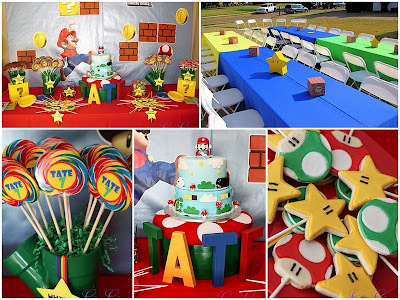 There were two very creative Mario Brothers parties submitted to the Party Party this year, and I thought I would show you my favorite elements from both. As I am not personally a huge Mario Bros. fan, I fear my ignorance is going to show through on this post. Ignore, me and just look at the cute details from Brittany at Grey Grey designs, and Ashley from Cute as a Fox. If you are going to have a dessert or serving table, that is the perfect place to recreate a scene from the game like Brittany did above (if you want to know how I make back drops, go here). Her 3D table decorations are simple, but make guests feel like they are in the middle of the game. You could add Boo Balloons (like Ashley did below) to the table settings. (Don’t you just love those?) Brittany spray painted pipes from the hardware store to serve as lollipop holders, while Ashley created the look of pipes by painting the tumblers that held her adorable mushroom pops. Both parties provided Mario and Luigi hats for their guests--Ashley’s also gave the option of princess peach crowns. I also love the plants full of candy by the doors, and the adorable toadstool radishes in the salad! I forgot to show you Brittany’s Mario mustaches. You’ll have to go check those out! Of course, both parties included some video gaming. Ashley held her party at a church and was able to get a couple of projectors, so that the games were huge on the wall. The great thing is that one of these parties was for a 7 year old boy, and the other was for an adult man (they never really grow up, do they? ), so this could be a great theme for the whole family! If you are looking for more Mario Brothers inspiration, I just found another fun party on Catch My Party. Hope this gets the wheels turning for those of you with boy party dilemmas. More to come! Thanks Kendra! That's so nice! I totally have these in my party folder for our own this summer…those gals are a.maz.ing! 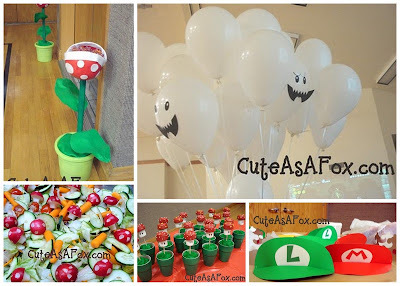 My February party was thisclose to being a Mario Kart party…and I was so excited! Maybe some other little boy will let me put together that theme for him…in the meantime I'm loving looking at all the other Mario parties out there!